Should You Wait to Buy? Mortgage Interest Rates are Still Going Up! Mortgage interest rates, as reported by Freddie Mac, have increased by close to a quarter of a percent over the last several weeks. Freddie Mac, Fannie Mae, the Mortgage Bankers Association, and the National Association of Realtors are all calling for mortgage rates to rise another quarter of a percent by next year. In addition to the predictions from the four major reporting agencies mentioned, the Federal Open Market Committee, www.federalreserve.gov/newsevents/pressreleases/monetary20180926a1.htm, recently voted unanimously to approve a 1/4 percentage point increase in the primary credit rate to 2.75 percent. Historically, an increase in the primary credit rate has translated to an overall jump in mortgage interest rates as well. 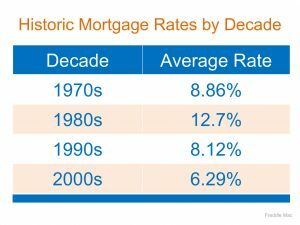 Though you may have missed the lowest mortgage rate ever offered, you can still get a better interest rate than your older brother or sister did ten years ago, a lower rate than your parents did twenty years ago, and a better rate than your grandparents did forty years ago!